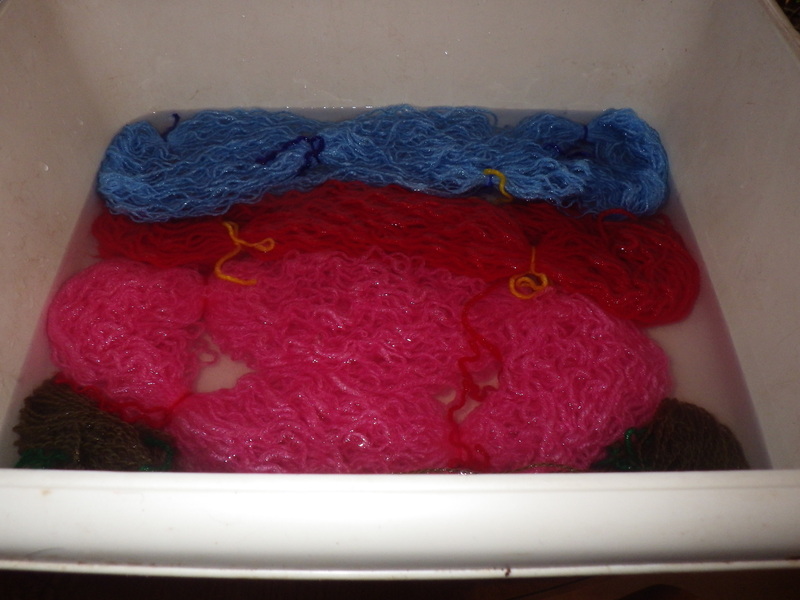 Of course, every time I make a pair there is some left-over yarn. 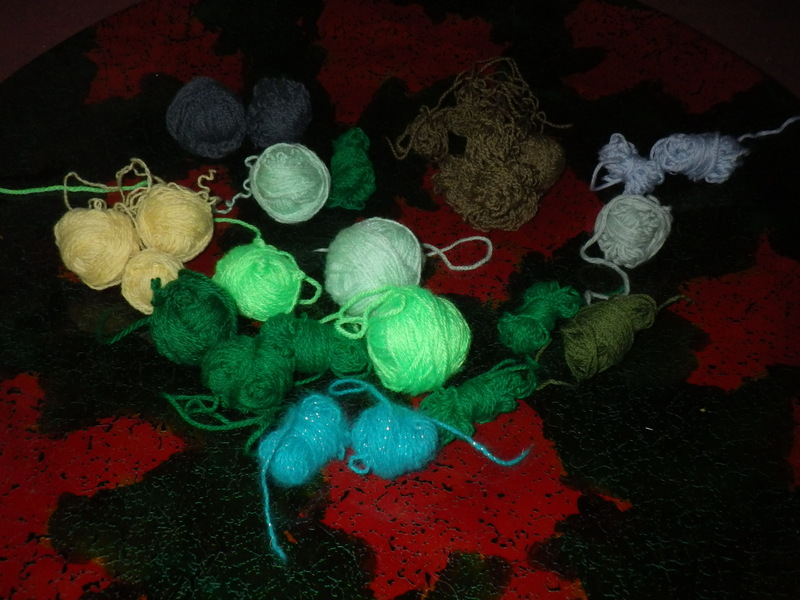 Slowly, I’m converting this into hexipuffs, from which I will eventually make a quilt. 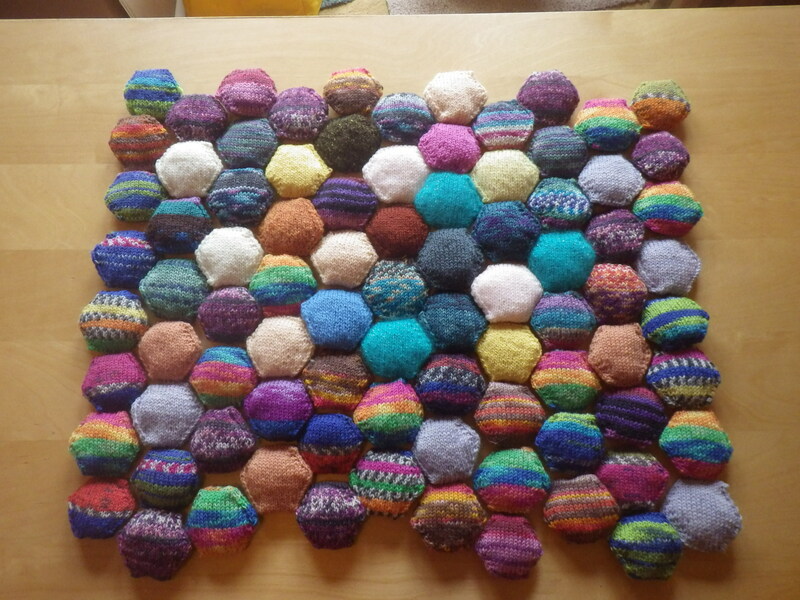 For a king-size quilt I need 900 hexipuffs. So far, I’ve made 106 so it could take me a while yet! 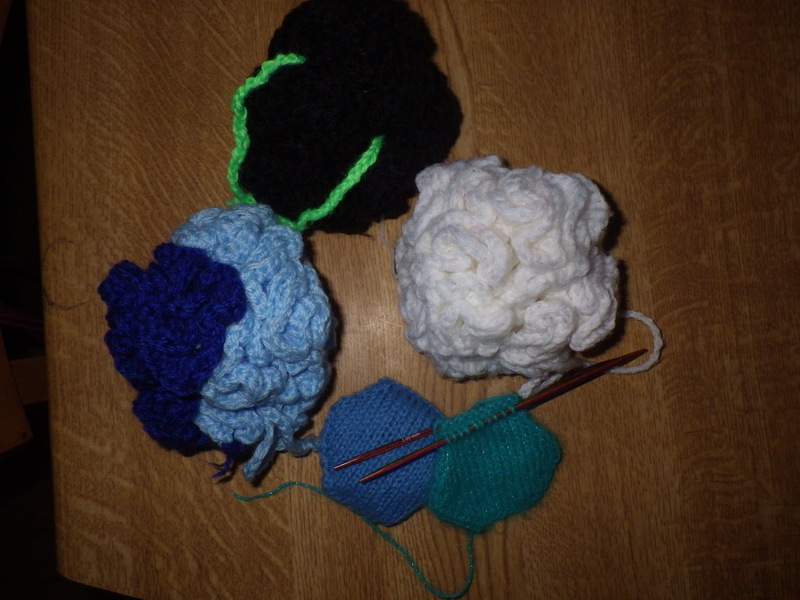 One hundred and six hexipuffs down, seven hundred and ninety four to go! I’m guessing that any knitters or crocheters reading this will know what the title means, but no one else. Starting any new craft seems to result in exposure to all sorts of new jargon and yarn crafts do seem particularly prone to this (I blame Ravelry). However, I thought you might all like to learn a bit of knit-speak (if you are really interested, you can learn what frogging is here). 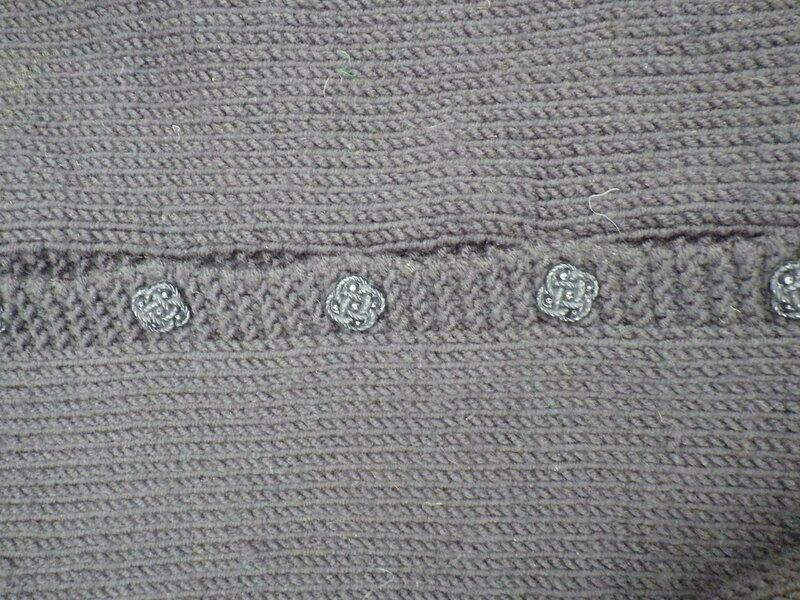 There are buttons to sew on – these had been in my collection for a couple of decades! 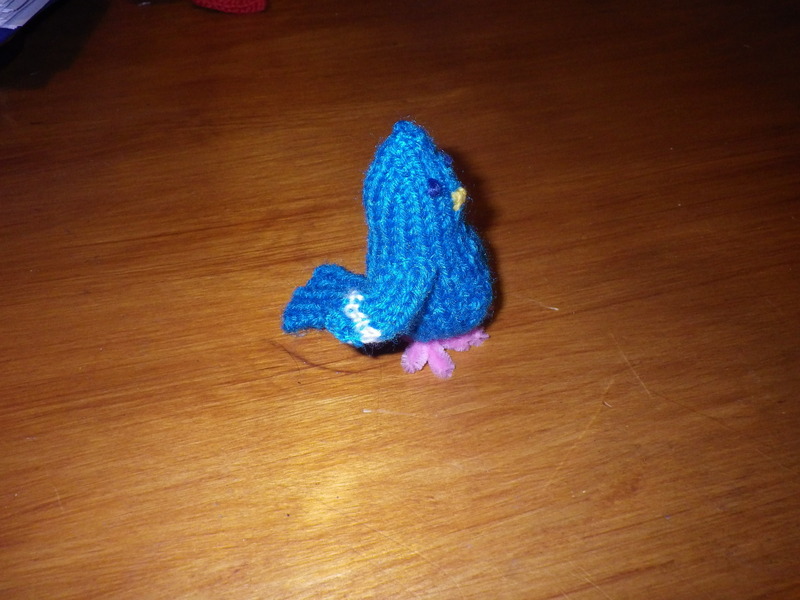 First, however, I have a confession… like many knitters I’m not very enthusiastic about sewing my knitting together. 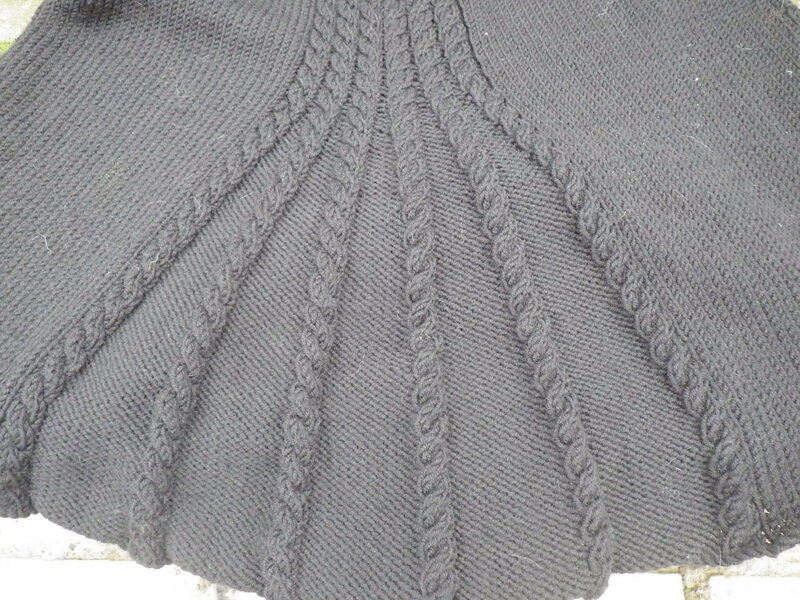 I love the knitting bit, but the finishing is generally quite tedious, This is why I like knitting socks with self-patterning yarn – you cast on, knit the sock like a tube and graft the toe to finish off, leaving just two tails of wool (one at the beginning and one at the end) to weave in before the whole thing is complete. 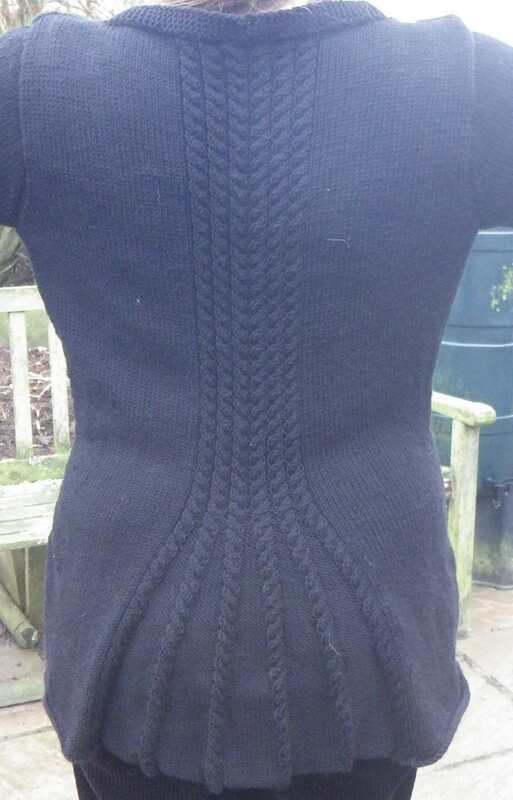 Bigger garments are more challenging to complete – there are often seams to sew together, buttons to stitch on and lots and lots of ends to weave in. And so, it is often the case that, because I am unenthused, I end up with a long-standing WIP (Work in Progress). Some projects were always intended to be a long-term WIP. My beekeepers quilt, for example, should take me several years to complete, especially since I only intend to use oddments… mainly of sock yarn. But mostly I intend a relatively quick turn-around. 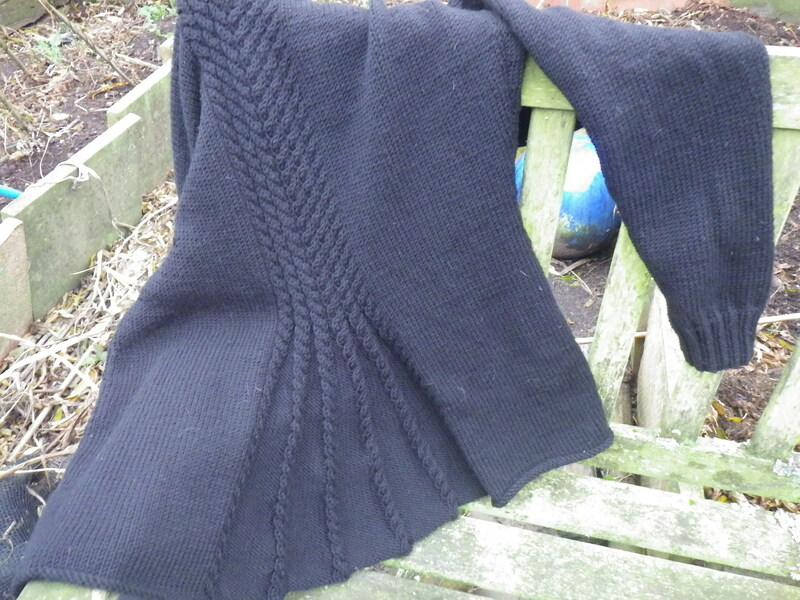 So, it is with great shame that I have to confess I have had one WIP hanging around for several months now, with the knitting completed and only the sewing left to do. This is the beautiful Debbie Bliss Sophia Cable Vent Jacket. So, finally, this week I decided to bite the bullet and get it finished. I set aside a whole evening, but that wasn’t enough, so another session was required, but finally I have a FO (Finished Object). I was really pleased to discover some buttons in my collection that were suitable to use – I remember buying them for a long black velvet dress I planned to make years ago that somehow never got made. 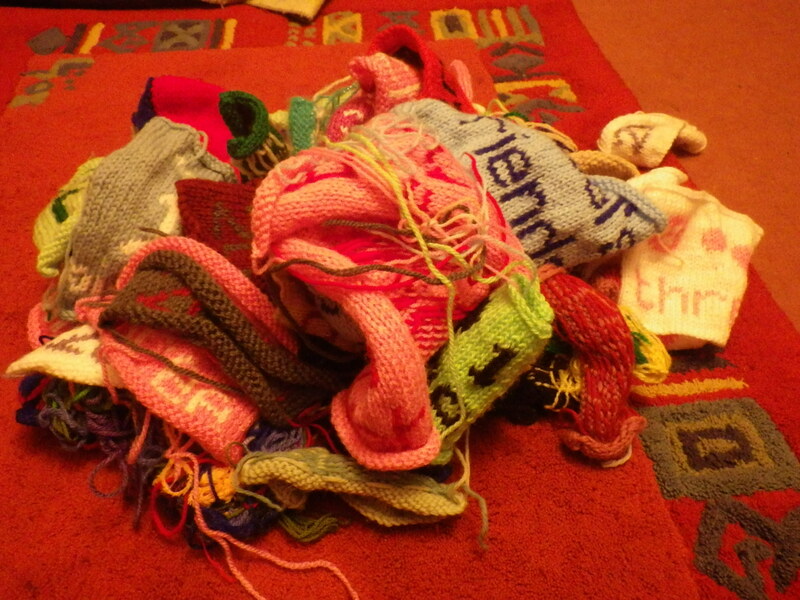 When you’ve finished a piece of knitting, there are always scraps or oddments of yarn left over. 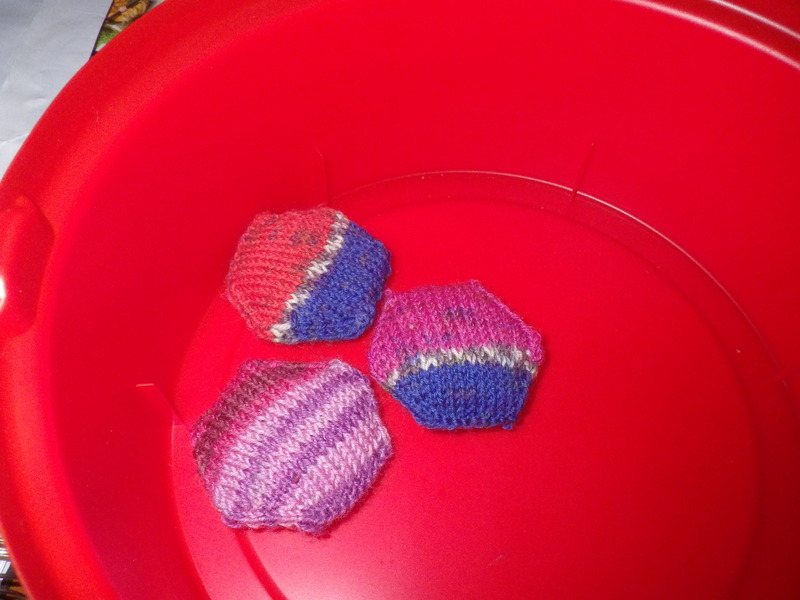 Currently, I’m using the left-overs from my sock knitting to make hexipuffs… tiny hexagonal padded pockets that will eventually become a ‘beekeepers quilt‘. I’d really like it to be big enough to cover our bed eventually, but I’m a long way off yet. 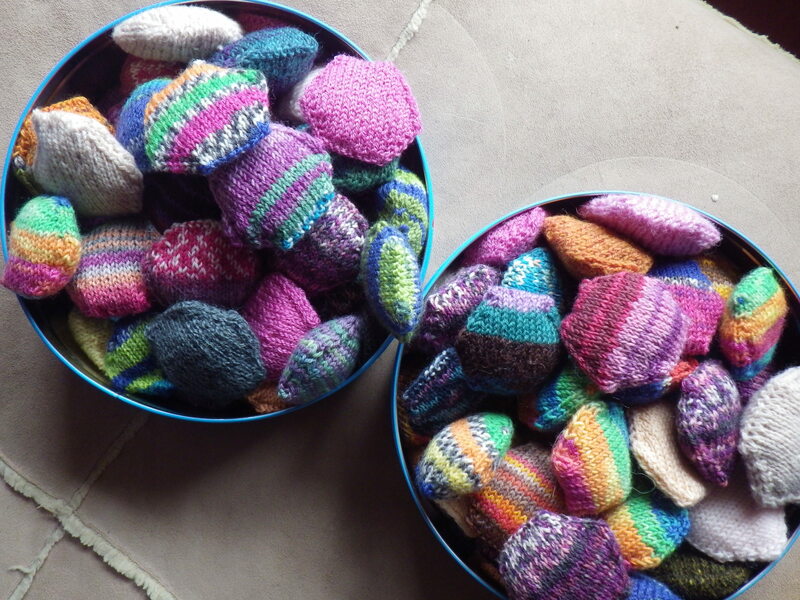 To date, I have knitted 86 puffs, but they don’t even make a square metre of quilt. 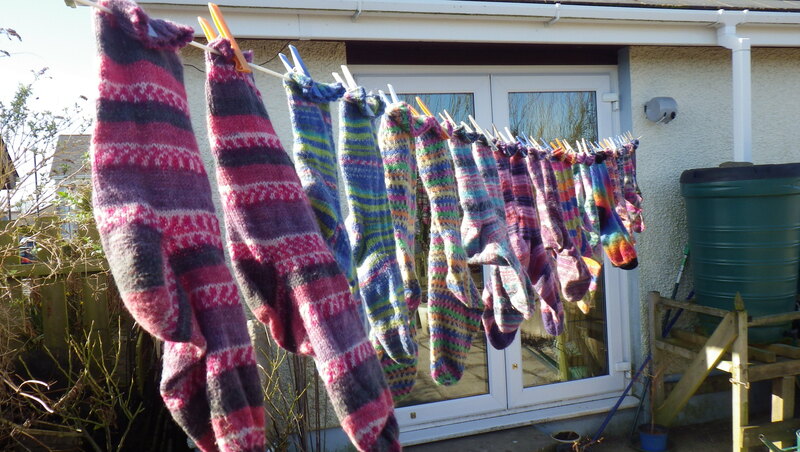 However, I still have lots of yarn oddments to work with and lots of sock yarn still to knit into socks. My intention is only to use left-overs and not to buy any new yarn for this project because I started it as a way to avoid waste. It’s also rather lovely to have a project like this, where it’s possible to complete a section in half an hour or so (with practice, I’ve got quicker at making them) and thus maintain a sense of achievement even when there’s still a long way to go. 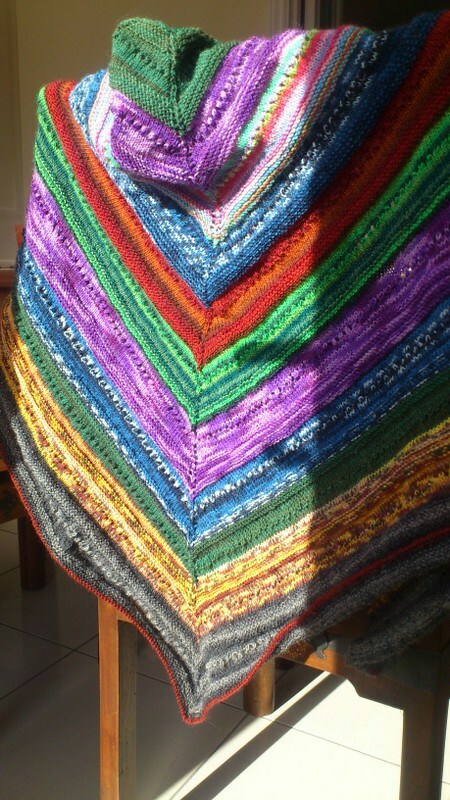 Despite my long-term goal, I have recently seen a another project for using sock yarn oddments that I would really like to undertake in the future, a ‘leftovers shawl‘ as made by planetcoops… perhaps I’ll get there in about four more years! 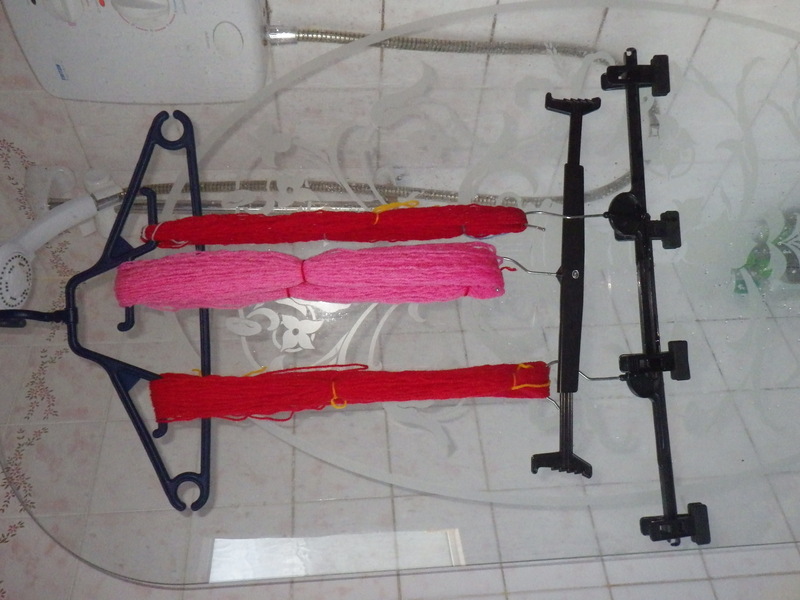 Of course, not all my oddments are 4-ply – the gauge I knit socks in – so I’m on the look out for other projects to use up double knitting and chunky yarn. Amigurumi is great for this, especially since I’m currently experimenting with my own designs… eventually I will have a crochet version of the knitted snails that star at the top of this page. 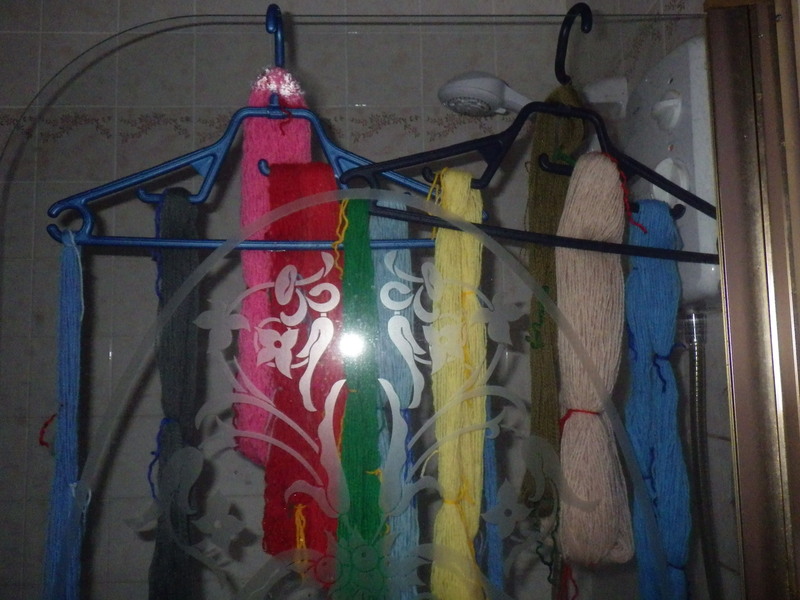 So, what do you do with yarn oddments? It’s the time of year again when small children find it very difficult to get to sleep… something about some jolly guy in red descending down their chimney in the middle of the night. Come to think of it, that’s something I might start to lose sleep over… especially since I’m guessing he’s likely to wreck our gas fire. Actually, I need little excuse to lose sleep… anything that gets lodged in my mind seems to resurface in the middle of the night and refuses to go away until about 20 minutes before I need to get up, at which point my brain switches off and I fall deeply asleep. It’s not too bad when I am at home – there is always the option of getting up, making a cup of tea and spending some time working, knitting or thinking about my permaculture diploma. In fact, I rarely get up these days, preferring to remain warm and in bed, listening to a talking book on my mp3 player via headphones so as not to disturb Mr Snail-of-happiness (who rarely has trouble sleeping). Currently I’m listening to Chocolat by Joanne Harris. In fact, it’s not my ideal book to doze off to because I’m never heard or read it before (it’s different to the film). The best books to fall asleep to are old favourites, particularly children’s books, which make me think of my parents reading to me in bed as a child… Roald Dahl is particularly good and I’m waiting for someone to make a recording of The Overland Launch by C. Walter Hodges, a book I clearly remember my mother reading to me and my sister when we were young. Mr S-o-h has kindly made me a recording of Jonathan Livingstone Seagull which I listen to when he is away, so that I get to hear his voice, although part of the story makes me cry, which isn’t necessarily a good thing! My real insomnia problem arises when I’m away from home. I go on courses quite often and end up sharing a room with people that I don’t know… sometimes even in a dormitory. Earlier this year I had to try to sleep in a very squeaky bunk bed in a room with six other people. Tossing and turning was simply not an option, so I ended up in the dining area at about 5am each day. 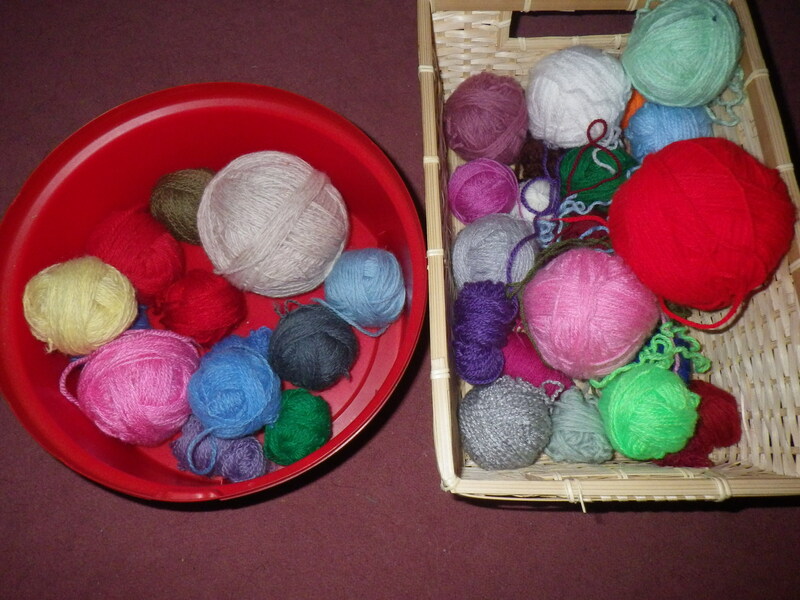 I certainly go a lot of knitting done (see left). More recently I had to share a hotel room with someone I did not know at all and where there was no safe communal space to retreat to, so no chance of getting up and being creative… well I suppose I could have sat in the bathroom, but I think my room-mate would probably have been rather worried by that! So I had one almost completely sleep-free night when I achieved nothing. And really this is my issue: I can see the point of sleep. It allows me to function properly the next day. If I have to have insomnia I’d really like to be able to treat it as an opportunity – making something, reading something, producing a permaculture design. 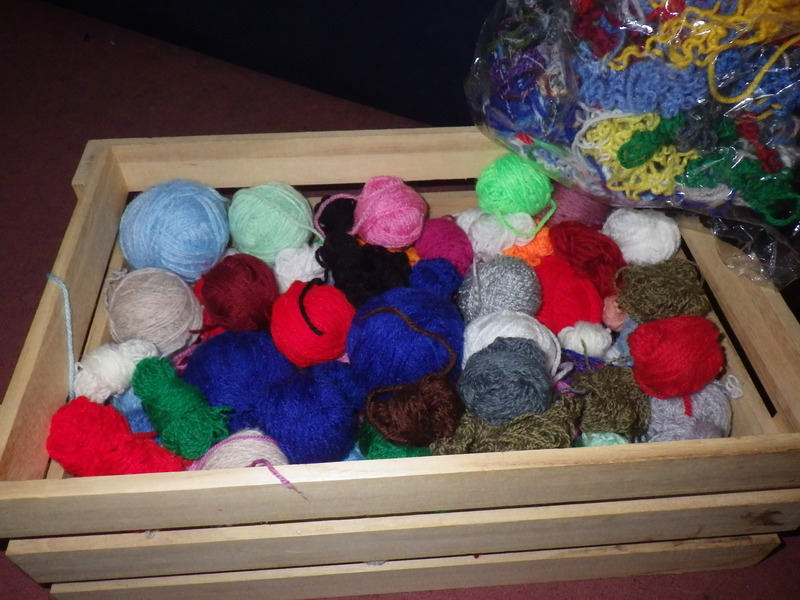 And so, before I book any more courses I’m going to make sure that the place I’m staying has either single rooms or somewhere I can sit and knit worms, socks, snails or hexipuffs without scaring my fellow learners!